La maison de la plage à Durell Point est un chalet privé d'un étage et demi sur 25 hectares. La propriété est située sur une plage de sable rouge de 2 000 pieds sur la baie de Howe. La maison de la plage est isolée dans un bosquet d'épicéas du Colorado et donne sur la plage et la baie vers les fermes éloignées et le détroit de Northumberland. The Beach House dispose d'un salon et salle à manger avec deux grandes baies vitrées donnant sur l'eau. Il y a deux chambres, chacune avec des lits jumeaux et une salle de bain complète avec baignoire et douche. La deuxième histoire a une mezzanine. La cuisine est équipée d'un lave-vaisselle, d'une cuisinière électrique autonettoyante et d'un réfrigérateur / congélateur. Un lave-linge, un sèche-linge et un barbecue à gaz sont également inclus. Il y a une grande terrasse devant la maison, surplombant la baie, avec une table de pique-nique et du mobilier d'extérieur. Une deuxième douche, située à l'arrière de la maison, dispose d'eau chaude et froide pour la baignade après le retour de la plage. Tous les draps, serviettes, vaisselle et ustensiles de cuisine sont fournis. La maison est nettoyée au début et à la fin de votre séjour. En outre, nous fournissons Mobilier d'extérieur. We had a wonderful stay at the Beach House! It was just what we were looking for - off the beaten path, quiet, picturesque, on the shore and very comfortable. We were within driving distance of everything we wanted to visit and do and the cottage was a great place to spend time too. Nancy and Bill were on hand to assist with anything we needed. We would highly recommend this lovely gem! Thank you for a lovely holiday home away from home! Overall, we are very glad we stayed here this year. The location is so quiet and secluded, and so close to the beach. The house is very nice, clean, simple, nicely furnished and has a nice deck. The only downsides where that the two bedrooms in the back had a musty smell and feeling to them, but perhaps that comes with being near the beach. The upstairs loft bedroom is wonderful, big, bright, and has good air flow. Proximity to the beach is amazing, but bring bug spray because there are mosquitos. The red dirt road leading the house is so nicely kept we felt like royalty each time we came back to the house. We had many wonderful walks on the beach and had it to ourselves most of the time, and a few times we met very nice people having a walk on the beach as well. 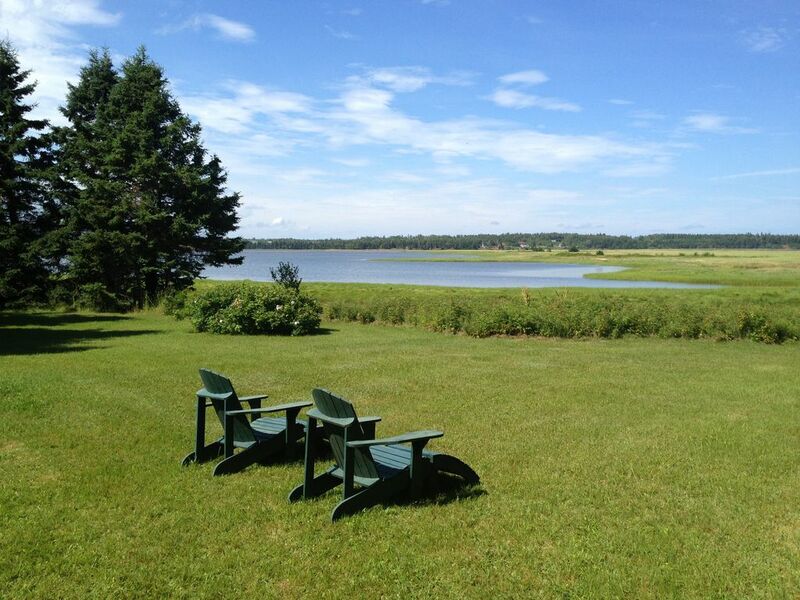 If you want a quiet, secluded place to stay, and feel as if you have PEI all to yourselves, this is the place! We loved the view and the idealistic cottage. It was comfortable and had all the amenities we needed to enjoy our stay. we look forward to the next time we come out and would for sure come back to this quiet beautiful place. A Week of Joy and Beauty at an Ideal Beach House! We are in our late 50's but everything I write is equally true for a family, with children of any ages. Upon arrival, the beach house at Durell Point was clean and welcoming, with a large deck overlooking the bay that the cottage sits on. Everything we needed, both for comfort and practicality, was in the cottage.We were well-informed about the property but could also easily reach people by phone if we had questions while up in PEI.The beach, with that amazing PEI red sand, is walkable during all tides but especially fun to walk at low tide when the beach goes out forever! This is the ultimate sand castle beach! The bay is quiet, clean and peaceful, filled with shore birds and sea life. There is a bakery nearby that is open most mornings. *Biking between Dalvay and Robinson's Island on a wonderful bike path in PEI National Park. We had our own bikes but there are many rental places. *The Greenwich Dunes: We went at the end of the day and watched the sunset on the water. We were literally the ONLY people there when we walked back across the floating boardwalk! Do not miss this place. *Basin Head: A great beach-walk with "singing sand". If you go late in the afternoon it won't be crowded. *Biking on the Confederation trail. *Kayaking on a variety of bays. Gorgeous and peaceful. It is easy to find places that rent kayaks. *Simply BE-ing together. We were so relaxed and comfortable at the beach house at Durell Point. *There are many other places on the island that are quite easy to get to from the house, like Charlottetown and the Green Gables route. We just didn't choose to go to those places. We hope to return to this beach house again in the future! The property is managed impeccably and we had everything we needed. You will love this place! This cottage was perfect! Walking distance to the beach, secluded and peaceful. We had the use of 2 kayaks and could paddle around the bay as well. You must have a car for the location. Souri is close by. It's about a 20 minute drive. Sally's Provincial Park is 5 minutes away. Great place to watch the tide pools! Highly recommend this vacation spot on wonderful PEI! This is a beautiful, serene place. Stunning views of the Gulf, incredible red beach, lots of herons. The cottage is immaculate, nicely yet simply renovated with many comfortable and thoughtful touches. It is a truly serene, private spot with a view of the herons in the inlet right off the deck and a glorious beach all along Howe Bay for hiking, exploring and kayaking a stroll away from the end of the driveway. If you like tranquility and privacy off the beaten path, this is a wonderful place to spend some time rejuvenating with the world of exploring 20 minutes to an hour in any direction. Les locataires sont à proximité les suivants: Parcours de golf Brudenell, Dundarave et Crowbush Cove Golf Resorts. Brochure disponible sur demande.